Gabriel's Wharf is home to an eclectic mix of independent shops, cafes, bars and restaurants. This arty enclave offers design-led shopping, from jewellery and fashion, to fair-trade furnishings and affordable artwork. Relax in one of the cafes and restaurants which enjoy spectacular views of the river Thames. Escape the bustle of the West End and head to Gabriel's Wharf to find truly unique gifts and a relaxed shopping experience. The South Bank provides a refreshing alternative in its relaxed, design-led shopping experience which Gabriel's Wharf and it's designer-makers typify. See the South Bank shopping directory here. Gabriel's Wharf is full of independent eateries and boutiques. Explore all of South Bank's restaurants and shops. In the late 1920s it was purchased by the Liebig Extract of Meat Company, creators of the famous OXO beef cube. Its architect, Albert Moore, incorporated the design as windows on a tower to get around the ban on skyline advertising. Each of the illuminated letters on the Oxo Tower measures over 10ft high. Head to Studio 6 for a great range of beers and wines, as well as British European Regional cuisine focusing on the best seasonal and locally sourced produce. Studio 6 is situated along London’s South Bank in Gabriel’s Wharf. We are located next to the famous ITV Studio’s and have been serving quality food and drink for the past 30 years. We offer a great range of Beers, Wines as well as British European Regional cuisine focusing on the best seasonal and locally sourced produce. The menu is constantly changing and is driven by market and season. Everything is prepared in-house and we care about what we do. Our Beers and Gin Menu are our pride and is considered. We are constantly tasting, debating, discussing and passing this interest onto our client base. Open from 12-11PM Mon-Sun, we are a great place to meet friends and colleagues for lunch and dinner, after work drinks or Sunday lunch. For further information and bookings, please see details below. You can also check our new website here. This summer, Elephant Juice will be hosting a healthy and vibrant riverside pop-up bar at Southbank Centre. All of Elephant Juice’s drinks are made fresh on their stall and, where possible, fruit and vegetables are locally sourced using seasonal produce. The heart of what Elephant Juice do is simple - fresh juices and smoothies all made onsite - using real ingredients bought daily from traceable and sustainable sources. If you lean towards naturally sweeter flavours, try the passion fruit and papaya juice with banana, orange and apple. Or if you're after something green, there's the kale, cucumber, parsley and lemon juice with ginger and apple. Jimmy Garcia is coming back to Southbank Centre for the summer with The BBQ Club. This expanded split-level, riverside summer eatery features a walk-up BBQ Bar and the BBQ Club rooftop restaurant. The upstairs BBQ Club's interactive six-course tasting menu includes some new and exciting dishes. And it’s all topped off with a private bar serving refreshing gins, beer and wine. Downstairs, the walk-up BBQ Bar will be serving super-fresh and speedy BBQ dishes such as hot smoked salmon with grain salad and crème fraîche, or the delectable monkfish burger with tarragon mayonnaise and dill pickled cucumber. Fancy a drink? Grab a sundowner at the riverside bar, which will be serving up a selection of beers, ciders and cocktails. A must visit for great beer. Established in early 2015 on the Southbank Centre Market, The Hop Locker has cemented its name on the South Bank, and across Central London as a must visit for great beer. Known for its constantly rotating taps serving highly regarded local, national and international breweries, The Hop Locker always go the extra mile to find unique and special beers. 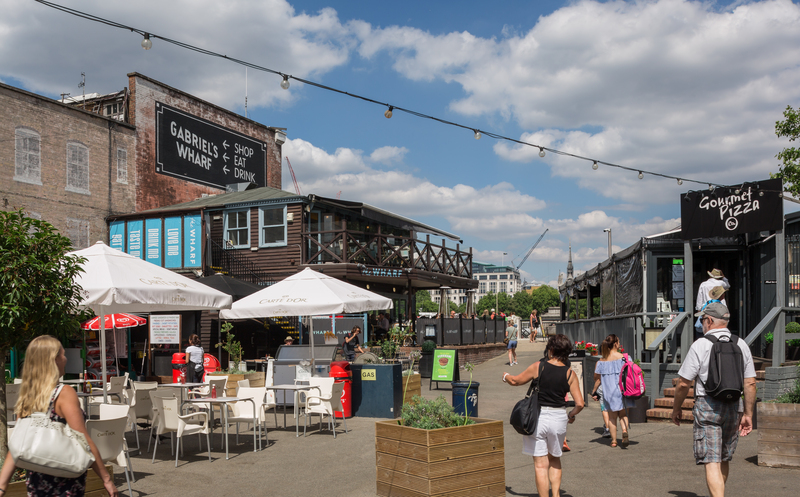 Voted ‘Best Bar/Pub’ for Waterloo & Southwark in the Time Out Love London Awards - and following on from their stint on the riverfront for both the Summer and Winter festivals in 2017 - they are excited to return once again and work with Southbank as part of the Summertime Riverfront popup under the Hungerford Bridge. They will expand their tap range and continue to serve an ever-changing selection of fantastic beers, wine, cider, cocktails and soft drinks. Hot dog specialists Oh My Dog! are coming back to Southbank Centre this summer! Hot dog specialists Oh My Dog! are coming back to Southbank Centre this summer, and their mission is still the same. Make you forget everything you once knew about hot dogs and introduce you to a whole new world of hot dog goodness. Featuring heritage breed frankfurters, handmade brioche buns and game-changing toppings, this popular pop-up is set to change your perception of hot dogs forever. Visit Oh My Dog’s stand at Southbank Centre this summer to sample unique specials such as the bourbon-marinated, cheddar-topped Chili-Steak Dog and every bacon lovers' favourite The Baconator.